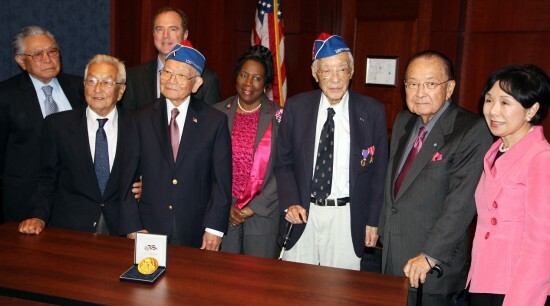 From right: Rep. Doris Matsui (D-Sacramento), Sen. Daniel Inouye (D-Hawaii), Yeiichi "Kelly" Kuwayama (442nd), Rep. Sheila Jackson Lee (D-Texas), Terry Shima (442nd), Rep. Adam Schiff (D-Pasadena), Susumu Ito (442nd), Ray Murakami (MIS). 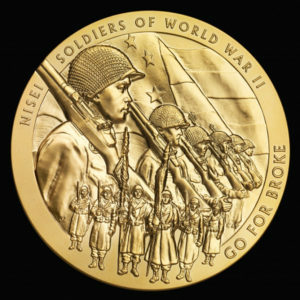 WASHINGTON — The Congressional Gold Medal awarded in 2011 to Japanese American World War II veterans in recognition of their extraordinary accomplishments will travel to seven cities across the country beginning in January 2013. The Smithsonian Institution Traveling Exhibition Service (SITES) has partnered with the Smithsonian’s National Museum of American History and the National Veterans Network to share the inspiring story of these men who fought with bravery and valor on the battlefields of Europe and Asia, even while many of their family members were held in American internment camps back in the U.S.
At the conclusion of the tour, the Congressional Gold Medal will be on permanent display in “The Price of Freedom,” an exhibition at the National Museum of American History in Washington, D.C. The medal will be accompanied by an educational package with an iPad application, social-learning website and curriculum developed by the National Veterans Network in partnership with the Smithsonian Asian Pacific American Program. Centered on the character values associated with Japanese American veterans — courage, respect, humility, perseverance, compassion and citizenship — these materials will provide users with a constantly growing, social-learning community. Rep. Doris Matsui (D-Sacramento), Rep. Adam Schiff (D-Pasadena) and Sen. Daniel Inouye (D-Hawaii) held a ceremony on Thursday kicking off the national tour. They were joined by representatives from the Smithsonian Institution, the steward of the medal, and the National Veterans Network. “We were designated ‘enemy aliens’ of the United States; however, we did not sit by and do nothing. We petitioned the government to give us the opportunity to demonstrate our love of country and our patriotism. hat opportunity was granted and thousands of men rushed to the draft boards to volunteer for military service. “The 442nd Regimental Combat Team was formed in 1943. The men of the 100th Infantry Battalion were those in service prior to Dec. 7, and the MIS was also established in 1943. When the war ended, the men of the 100th Battalion, the 442nd, and the MIS went home and found themselves declared to be members of the most decorated military unit in the history of the United States. The Congressional Gold Medal was awarded to 100th, 442nd and MIS veterans by Congress on Nov. 2, 2011, in recognition of their exceptional service, sacrifice and loyalty to America. The medal represents Congress’ highest expression of national appreciation for distinguished achievements and contributions. A complete list of recipients is available at House.gov. Commonly known as the “Go for Broke” regiments, the 100th/442nd is one of the most highly decorated units in U.S. military history, having earned more than 4,000 Purple Hearts, 560 Silver Stars, seven Presidential Unit Citations and 21 Medals of Honor (including one for Sen. Inouye). The MIS, whose highly specialized contributions helped hasten the end of the war, was honored with a Presidential Unit Citation in 2000. More than 19,000 Japanese American soldiers served in these units during World War II. The national tour of the Nisei Congressional Gold Medal is made possible by the support of AARP, Comcast/NBC Universal, Cole Chemical, Southwest Airlines and Pritzker Military Library. The National Veterans Network (www.nationalveteransnetwork.com) is a coalition of Japanese American veteran and civic organizations, representing eight regions in the U.S., that advocates on a national level to educate and enlighten the public about the experience and legacy of the Japanese American World War II soldiers. Founded in 1846, the Smithsonian Institution is the world’s largest museum and research complex, consisting of 19 museums and galleries, the National Zoological Park, nine research centers, and numerous educational and cultural programs. To learn more about the collaborating Smithsonian offices involved in this project, visit http://sites.si.edu, http://americanhistory.si.edu and http://apa.si.edu.